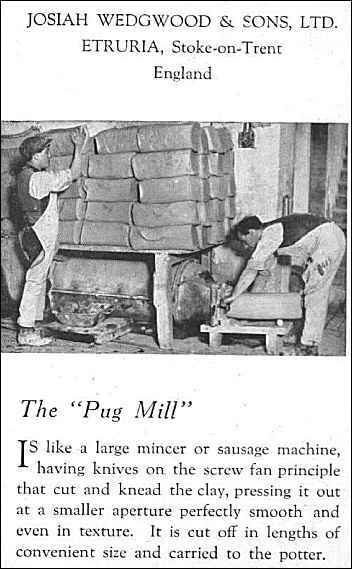 Before the pug mill was invented the air was removed from the clay by throwing or 'wedging' it. It was a tiring manual job (often carried out by children). Proprietors Messrs. MINTON and BOYLE. HOT-HOUSE and THROWING ROOM. Temp. 94 Fahren., open air 42. I have worked for Mr. Minton 18 years next Christmas. 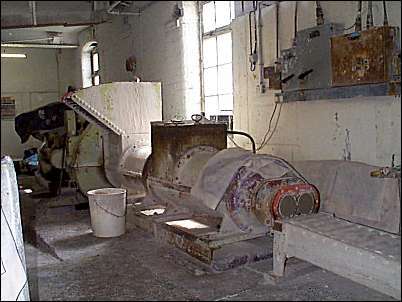 Slip-making in the fore part of my service, that is making the clay for use; I now look to the ware in the hot-house; besides that I beat the clay in the adjoining room; beating clay is tremendous hard work; I stand near the open door to do that; the hottest work is in the hot-house; don't keep a thermometer there; heat rises from 90º to 120º; 'tis not so hot now by a deal as in the morning; we cool it now for the ware. I am paid by the quantity of work done; my average wages are about 15s. per week. I have a wife and 7 children; only one is a potter. I come to work at 6 in the morning, sometimes at 5; it depends upon what goods are in heat; leave at 3, 4, 5, and 6; and afterwards do a little job-work for another master, and earn 4s. or 3s. a-week. Don't find the great change of heat affect my health; it sometimes affects others; very few live to any age in such an employment, 'tis the hardest business of potting. I live at Harford Bridge; do not go home to dinner; I take my dinner in the throwing- house; get bread and cheese, no ale; but get some meat at home at night; can't read or write. 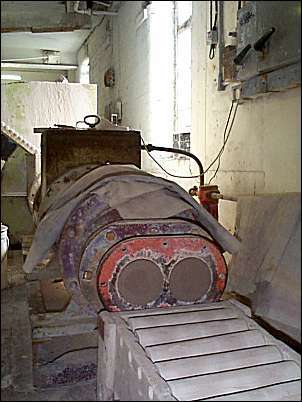 the need for the air to be removed from the clay by 'throwing' it.